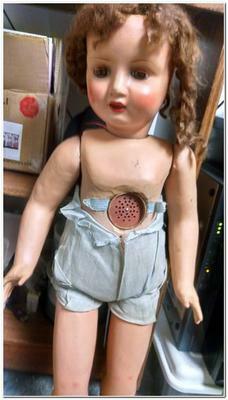 Need help with this doll!! 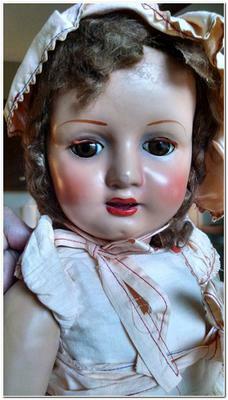 This doll stands Approx 28" tall. 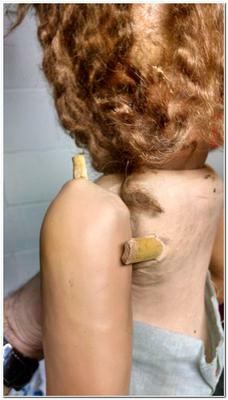 Head turns along with movement of legs (walker doll). No makers marks! 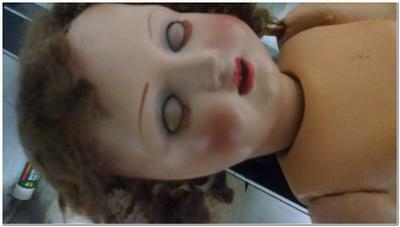 Anyone have any ideas as to maker or name of this doll? Also, has odd sticks through back and arm for kids to work the arm. See photos! Comments for Need help with this doll!! She looks very similar to my doll. Sorry to say I don't know anything about your doll. She does resemble my doll in many ways. Same height, wooden sticks, walks and head moves. Mine doesn't have a talking facility ( sorry don't know what you would call it) when I was given my doll she was wearing red shoes tied with ribbon, a satin pink dress with small flowers and pleated blue edging. She is also wearing some kind of parchment underwear including a vest and a straw hat with pleated blue ribbon around it. Her hair is blonde, which seems to be fixed onto a separate what seems like some kind of thick cardboard type material. I suppose we'll just have to keep looking. I'm in the UK.